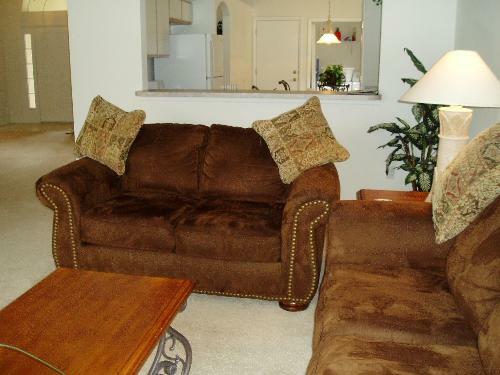 3 bedroom, 2 bathroom villa in the Hampton Lakes community. Owned by Philip & Tracy Martin. Ref: 2012. 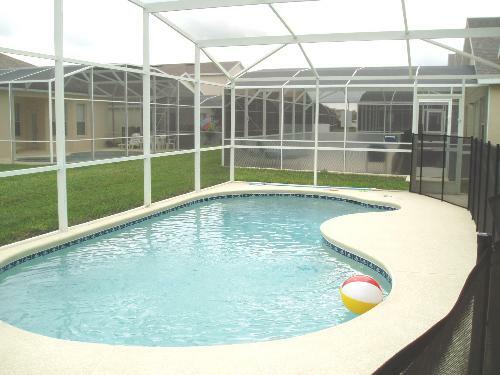 Superb 3 Bed, 2 Bath Villa with private pool at Hampton Lakes. 15 minutes to Disney. Not to be missed! Only 15 minutes from Disney our beautifully appointed villa is located at Hampton Lakes. It provides 3 bedrooms/2 bathrooms and sleeps up to eight people when the put-up bed is used. The villa provides 2 separate living areas, fully fitted and equipped kitchen, dining and breakfast areas, and is fully air-conditioned throughout. The villa is located in a quiet community but within easy access of local shops and other facilities. Our private pool also provides free solar water heating. 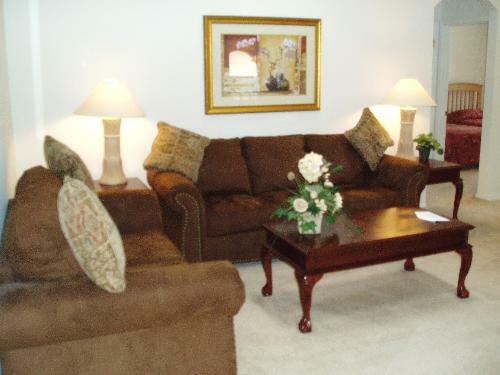 The Hampton Lakes community also provides tennis courts, volleyball courts and childrens playareas. 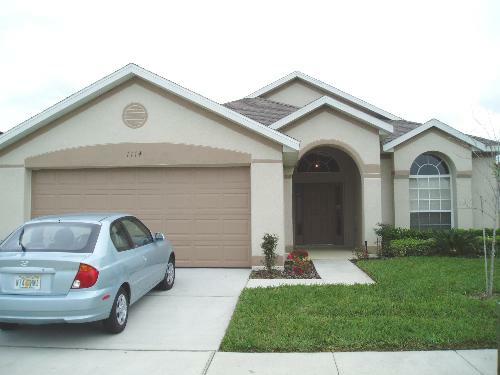 We are certain that our villa will provide you with a wonderful base for your holiday in Orlando. 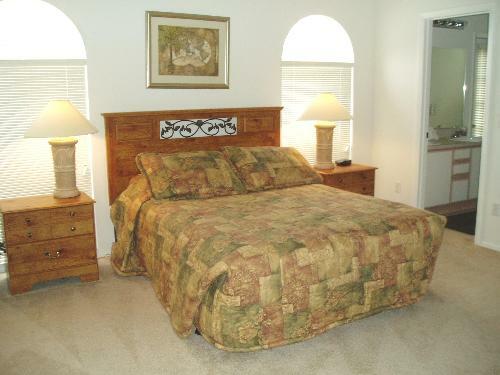 Our villa is located on the Hampton Lakes estate in Davenport. It is a short 15 minute drive from Disney World. Facilities on the estate include tennis courts, volley ball court and a childrens play area located close to the villa. The villa is fully air-conditioned throughout,with central heating available if required during the winter. In addition to this pool heating can also be provided at no extra cost. 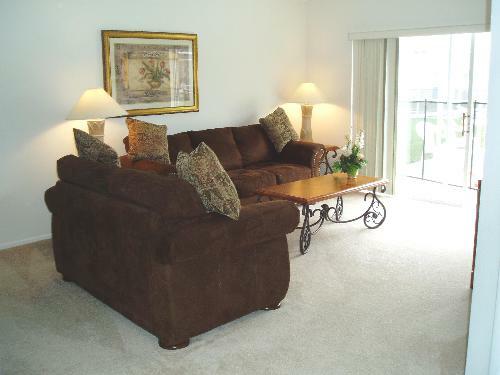 There are 2 large living areas, each with 2 sofas and occasional tables. The family room includes a television with over 70 cable stations, together with DVD player and a selection of films. There is also access to the pool area via patio doors. The living room provides a relaxing area including seating and a small library of books for your use if you need some 'quiet time' during you stay. Free local and international telephone calls are available from the villa. In addition to this we also provide free broadband wireless internet access - you just need to bring your laptop and you will be able to keep in touch with friends and family while you are away. 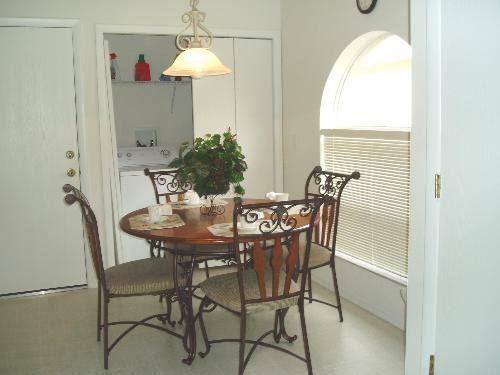 A breakfast area is contained within the kitchen with seating for 4 people. Should you have young children a High Chair is available for your use. 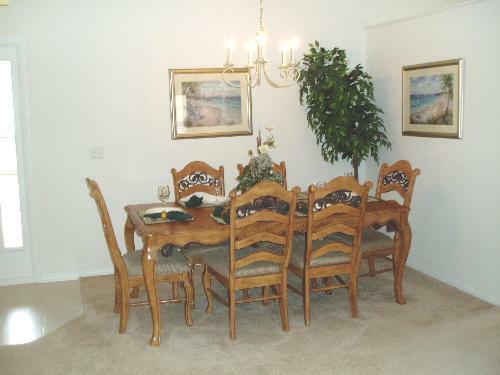 A more formal dining area is located next to the living room with seating for 6 people. The villa has three bedrooms, two double and one twin; a further two people can use the put-up bed in the living area. The master bedroom is furnished with a queen sized bed and matching furniture including ample storage space and walk in wardrobe. A TV with access to all cable stations is also in this room together with a safe for you to use during your stay. This bedroom leads to an en-suite bathroom which includes a bath and separate walk-in shower as well as direct access to the pool area. The second bedroom is furnished with a double bed with matching furniture and storage space, together with TV with access to all cable stations. 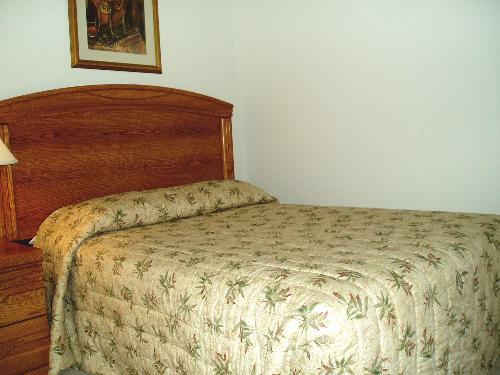 The third bedroom provides twin beds as well as TV, with all cable stations, and a PlayStation 2 with games. This is useful if you have children who wish to use this whilst other members of your group are watching TV in Family Room. 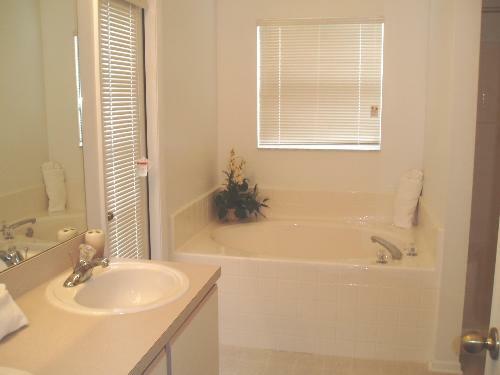 A second bathroom serves these 2 bedrooms and includes a bath and shower. New for 2009 is our Games Room which includes Pool, Table Soccer, Air Hockey and Darts. A security deposit of £200/US$350 is required which is refundable on return. Just back from a 2 week holiday. We had a wonderful time staying at this villa, a real home from home! 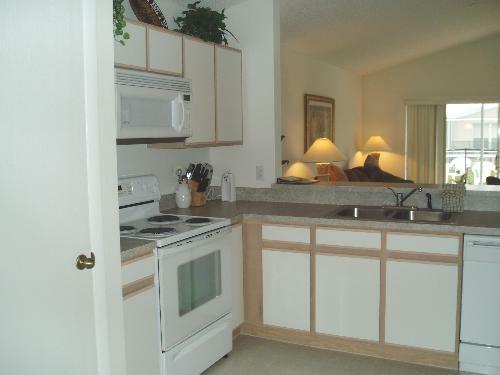 Well situated close to I-4 which takes you to all the major attractions & malls. The villa itself was lovely, very spacious with 2 separate living areas & good sized bedrooms. Loved the outside area, great to have our own pool to relax by in a quiet neighbour. Would definitely recommend this villa. Stayed in this villa for 2 weeks during June 2017. 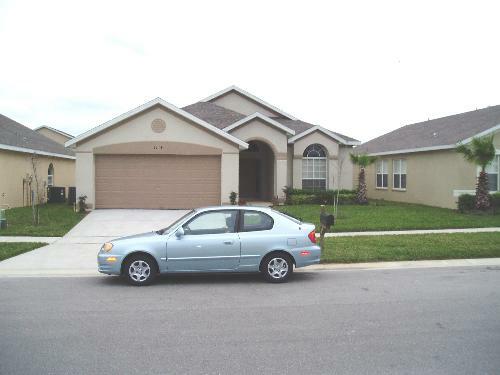 The location of this villa is ideal, situated within Hampton Lakes, a community on the 27 situated half way between the 192 and the 4 giving easy access to all aspects of the Orlando amusements, attractions, restaurants and shops. The villa itself is lovely. Big open plan kitchen/dining/lounge area, amply sized bedrooms and a well positioned patio/ pool, giving morning sun to the rear of the patio area and late afternoon/ evening sun streaming into the patio doors and windows of the villa. We had a wonderful stay in this villa and would re-book this exact one in a heartbeat! Your enquiry will be sent to villa ref 2012 only. This page has been viewed 89100 times since 06 Mar 2005.